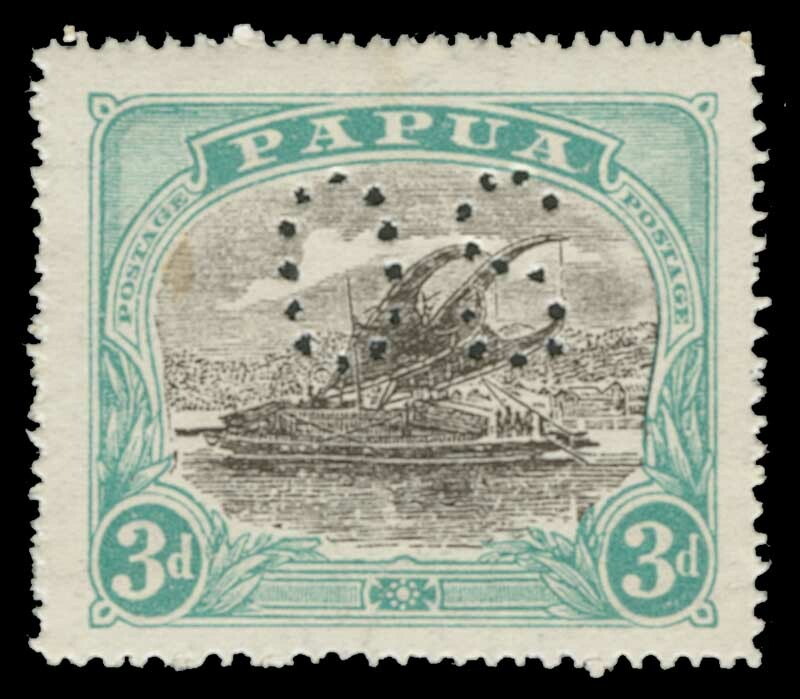 1901 2½d, 4d (faint crease), 6d and 1/- Thick Paper Horizontal Wmk, 1901 ½d, 1d and 2d Thick Paper Vertical Wmk, 1906 1d, 2d and 2½d Thin Paper Vertical Wmk Large Papua O/P and 1907 1d, 2d and 6d Thin Paper Vertical Wmk Small Papua O/P Lakatoi's in fine MLH condition. Odd minor blemish. Sg 4-7, 9-11, 22-24 and 39, 40 and 43. Catalogue Value £395.00. 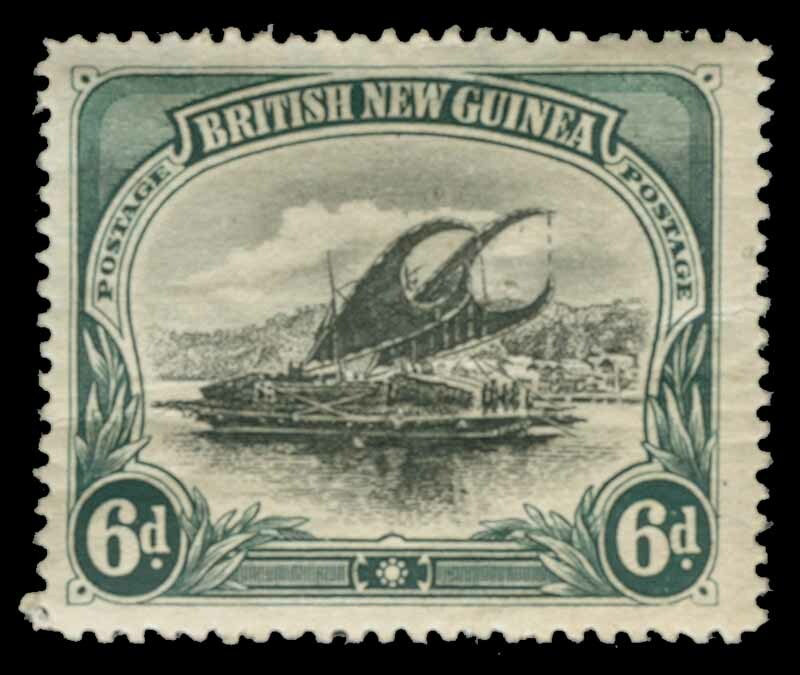 British New Guinea 1901 Thick Paper 6d Black and Myrtle Green Lakatoi with Horizontal Wmk FU, 1901 ½d, 1d, 2d and 2½d Thick Paper Lakatois with Vertical Wmk FU, Papua 1911 Monocolours set to 1/- value FU and 1917 One Penny Surcharge set CTO on 15th May 1921, a few with toning. Sg 6, 9-12, 84-90 and 106-111. Retail $318.00. 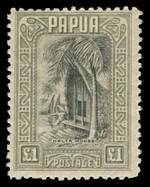 British New Guinea 1901 Thick Paper 1/- Black and Orange Lakatoi with Horizontal Wmk, 1906 6d Black and Myrtle Green Thick Paper Large Papua O/P Lakatoi with Vertical Wmk and 1907 2/6 Black and Brown Thick Paper Small Papua O/P Lakatoi with Horizontal Wmk MLH. Sg 7, 26 and 37. Retail $250.00. 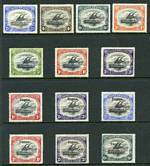 1901-1905 Lakatois set to 1/- value with mixed watermarks. 6d value thinned. Retail $275.00. 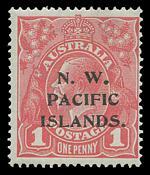 1901 1d red on buff postcard unused. 4,558 cards were issued. Superb condition. ASC PC1. 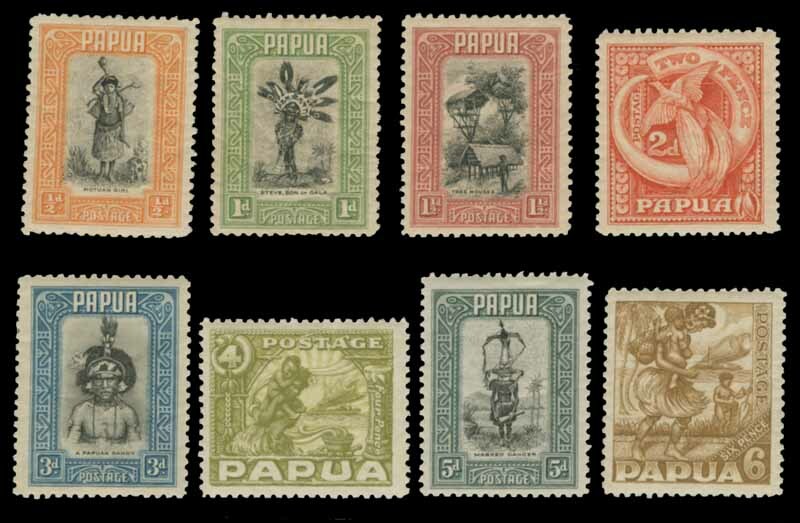 1907 ½d Black and Green MLH and 2/6 Black and Brown MUH (position 8) perf 11 Large Papua Lakatois and 1911-1915 Monocolour Lakatois set to 1/- value including both shades of ½d value MLH. Sg 47, 48 and 84-90. Retail $182.00. 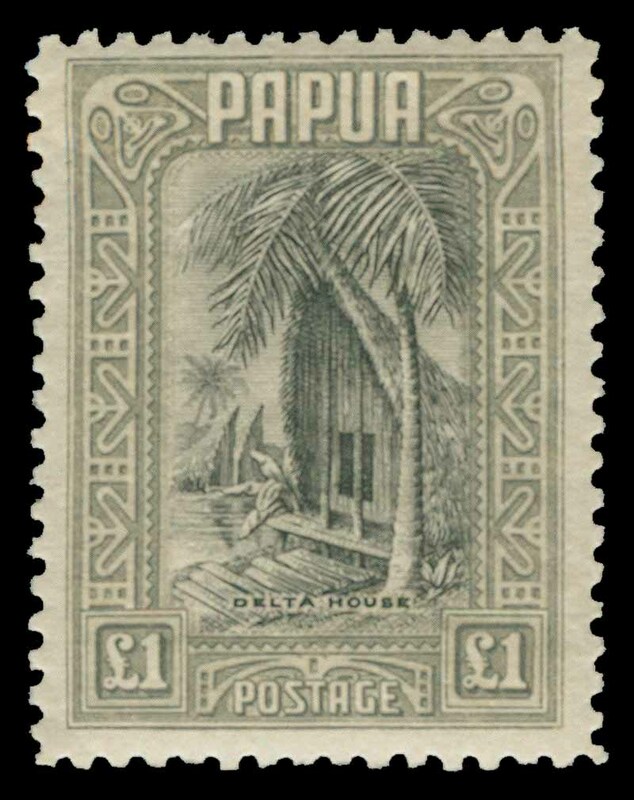 1907 Thin Paper Small Papua O/P Lakatoi set with vertical Wmk and 1910 Large Papua Lakatoi set MLH. Few faults. Sg 38-45a and 75-82. Catalogue Value £325.00. 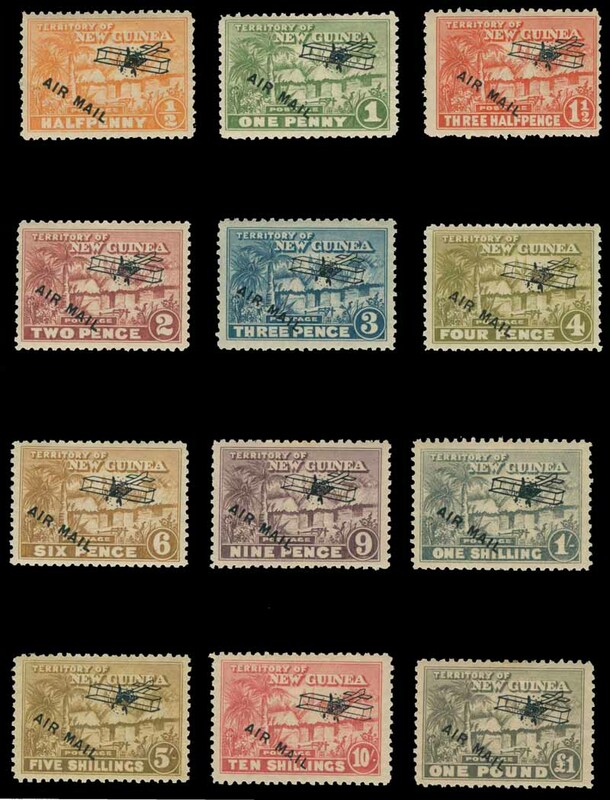 1932 Pictorial Definitive set MLH. Sg 130-145. Catalogue Value £550.00. 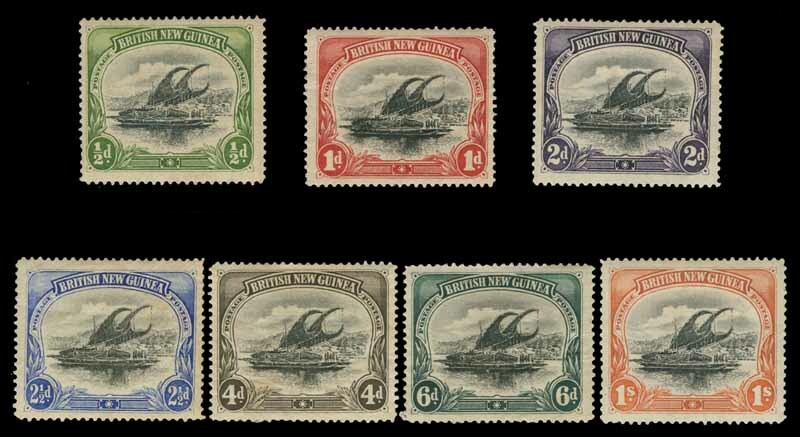 1932 Pictorial Definitive set MLH. 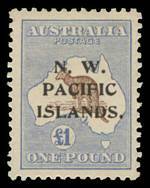 5/- value has a few short perfs and minor blemishes on a few other low values. Sg 130-145. Catalogue Value £550.00. 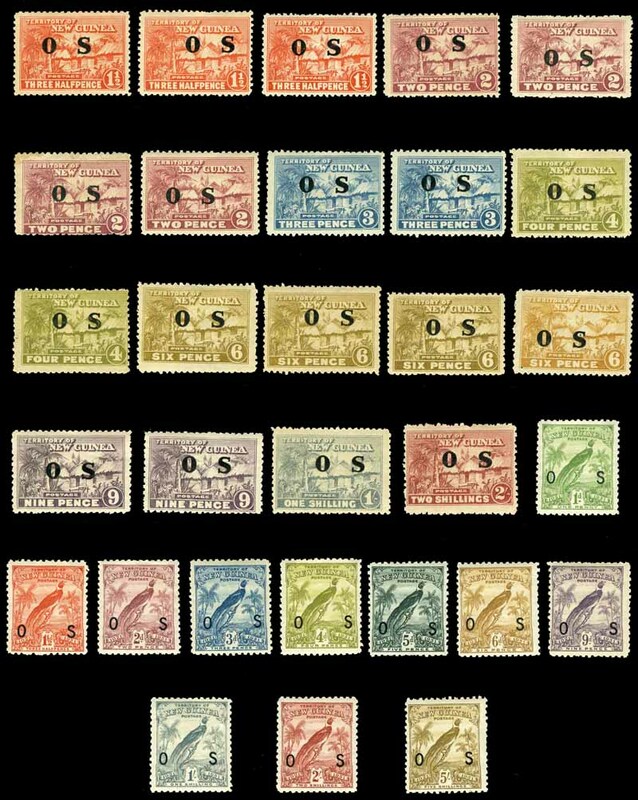 1934 British Protectorate set MLH and FU, 1935 Silver Jubilee set MLH and FU, 1937 Coronation set MLH and FU, 1938 British Possession set MLH and 1939 Air set to 1/- value MLH and FU. 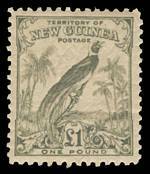 Catalogue Value £187.00. 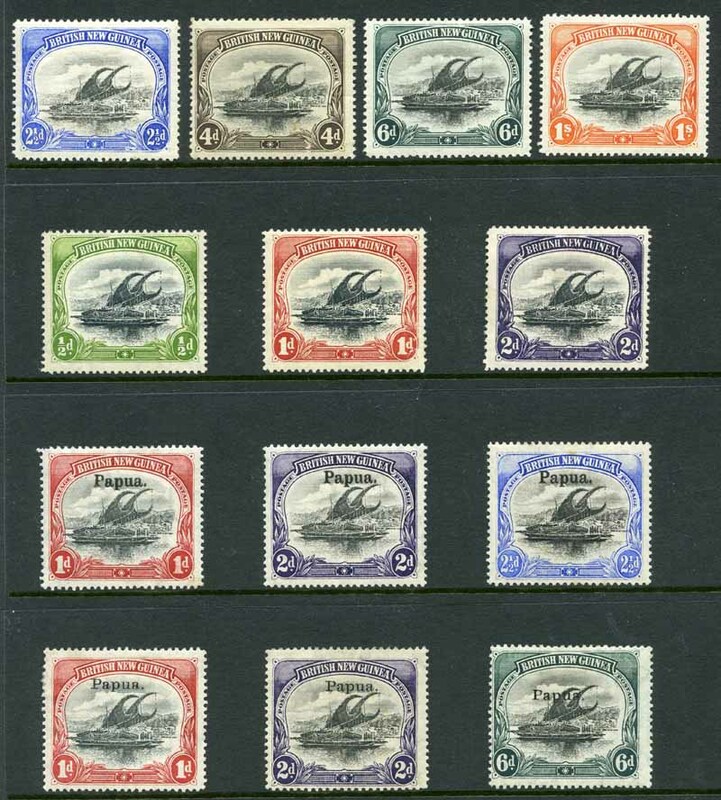 1930 2d Deep Brown-Purple and Lake and 3d Black and Blue-Green Lakatois perf OS MLH. Sg O49-O50. Catalogue Value £150.00. 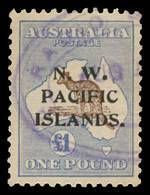 1915 10/- Grey and Pink 1st Wmk Kangaroo Type C MLH and well centered with broken tail variety. Sg 84. Retail $200.00++. 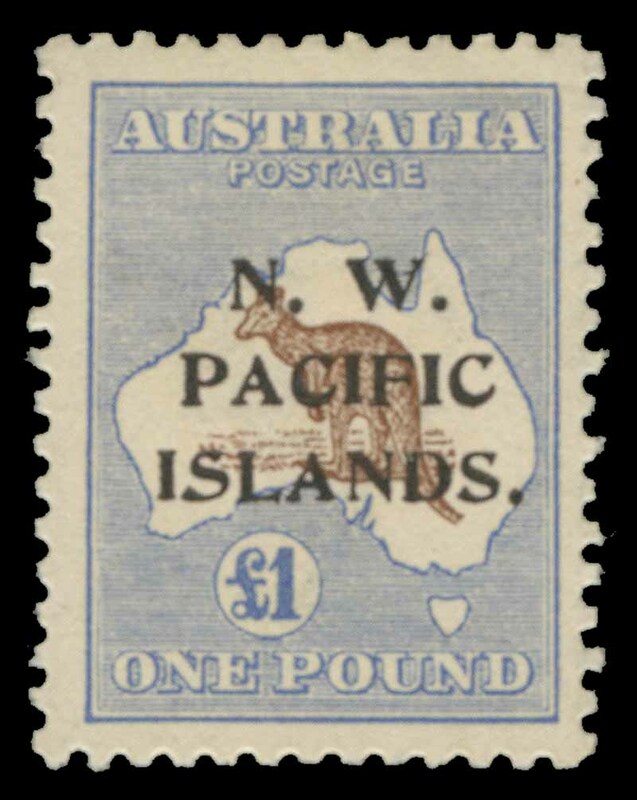 1916 £1 Chocolate and Dull Blue 3rd Wmk Kangaroo Type B in fine reasonably centered MLH condition. Sg 99. Retail $975.00. 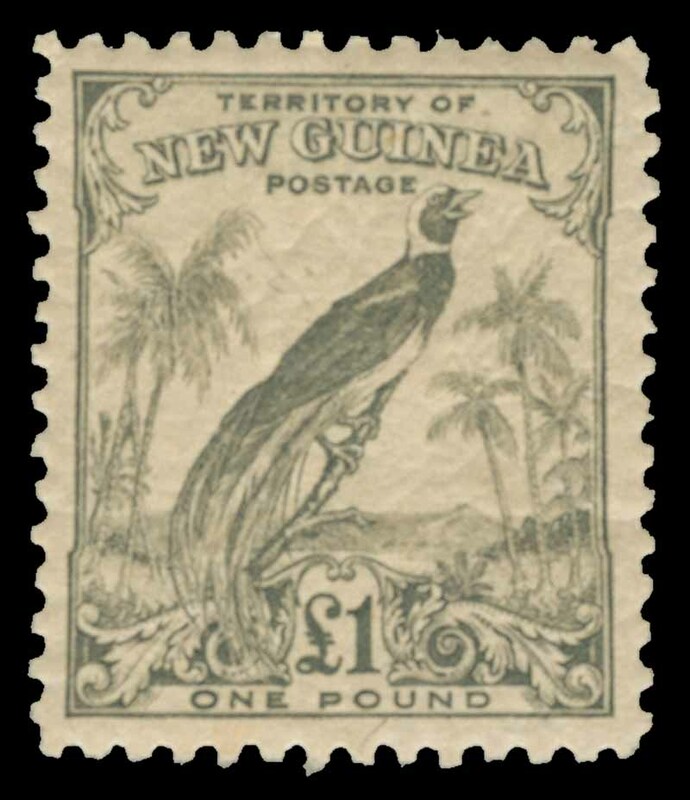 1916 £1 Chocolate and Dull Blue 3rd Wmk Kangaroo Type B FU with Violet oval Rabaul Radio Station cancellation. Sg 99. Catalogue Value £450.00 +25%. 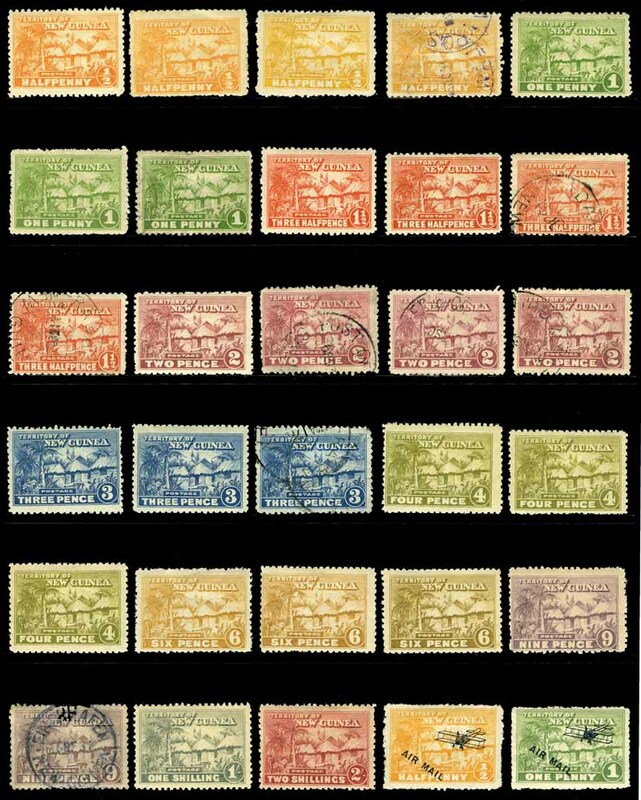 Collection of 31 MUH or MLH and 26 fine used stamps with some light duplication including 1915 5/- Grey and Yellow 2nd Wmk Kangaroo MLH and 1919 2/- Brown and 5/- Grey and Yellow 3rd Wmk Kangaroos with P over IS FU. Odd minor fault. Retail $1,430.00. 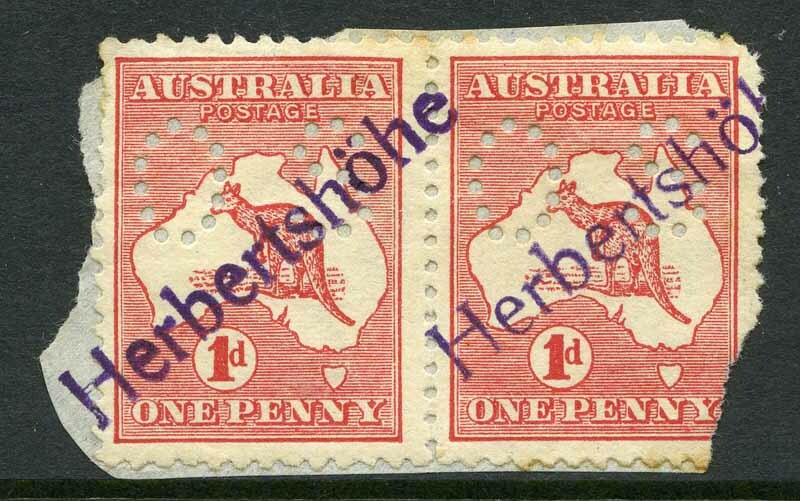 1913 1d Red Die IIA 1st Wmk Kangaroo perforated small OS pair on piece, cancelled with two strikes of 'Herbertshöhe' straight-line handstamp in violet. Right unit missing lower right corner. 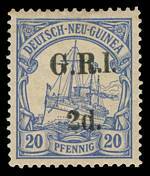 1914 2d G.R.I. 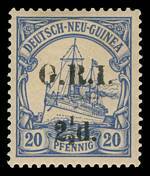 on 20pf Ultramarine German New Guinea Yacht with G.R.I. and value 6mm apart and variety "1 for I" MLH and well centered. 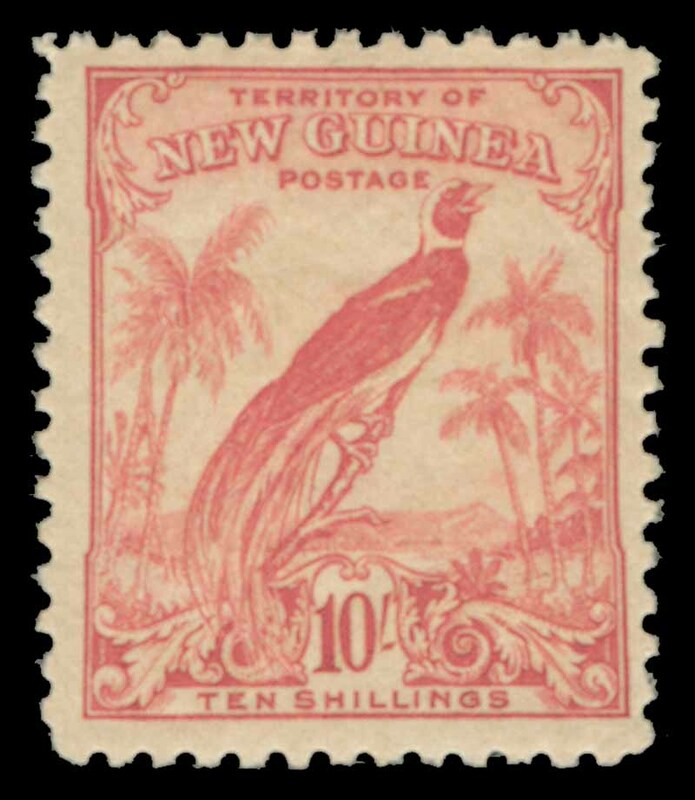 Setting 1, position 10. 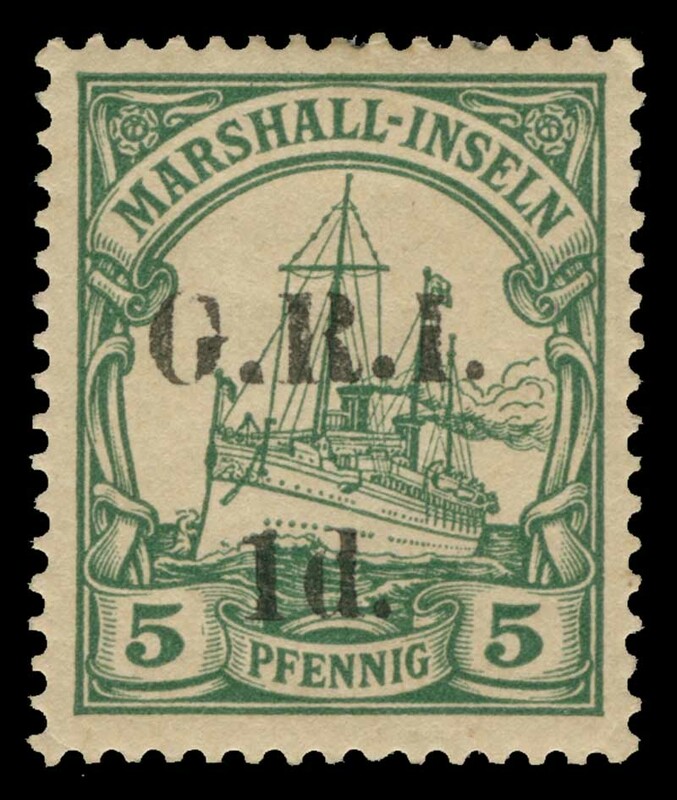 Expertisation mark on reverse. Sg 4a. Catalogue Value £375.00. 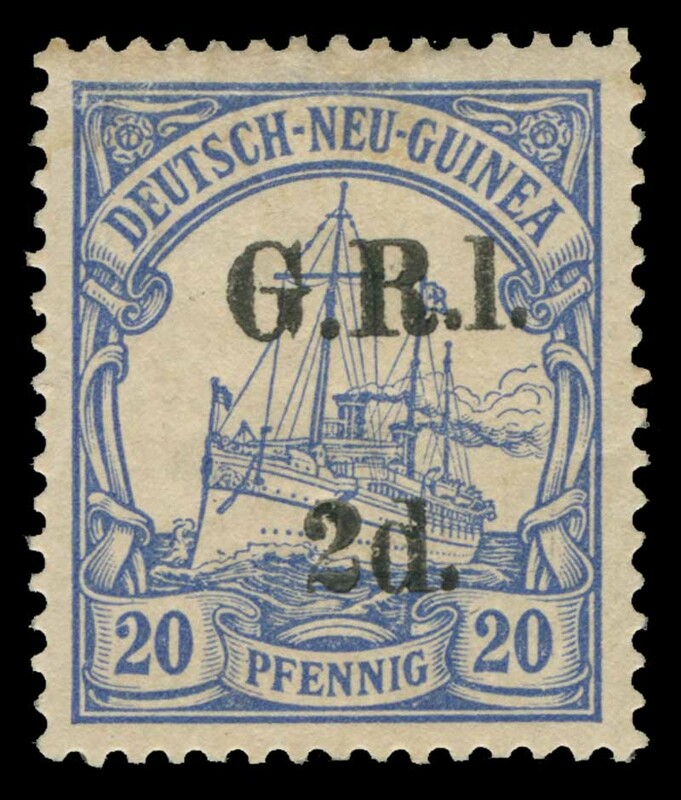 1915 2½d G.R.I. 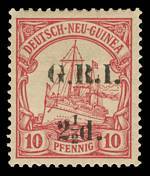 on 10pf Carmine German New Guinea Yacht with G.R.I. and value 6mm apart mint hinged and well centered. Setting 4, position 7. 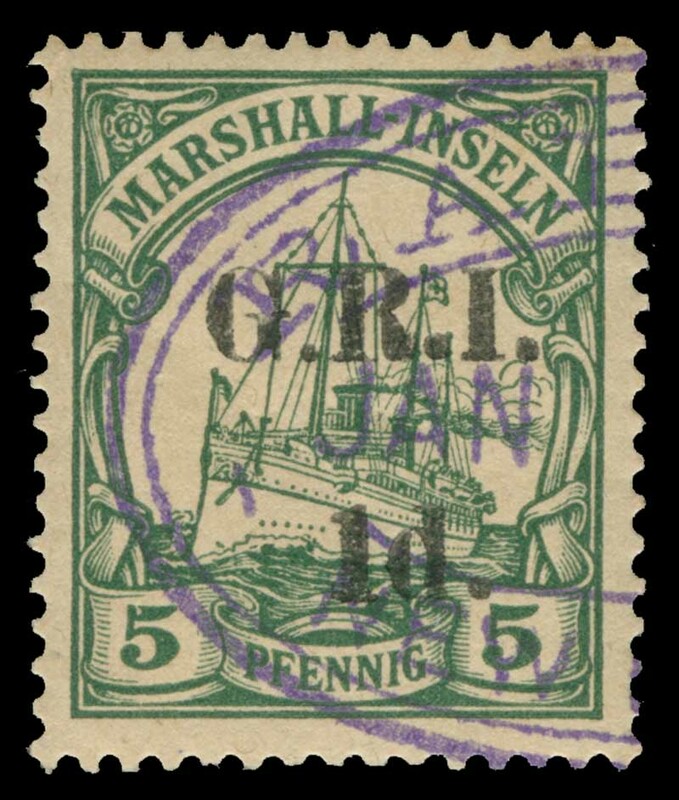 Expertisation mark on reverse. Sg 5. Retail $125.00. 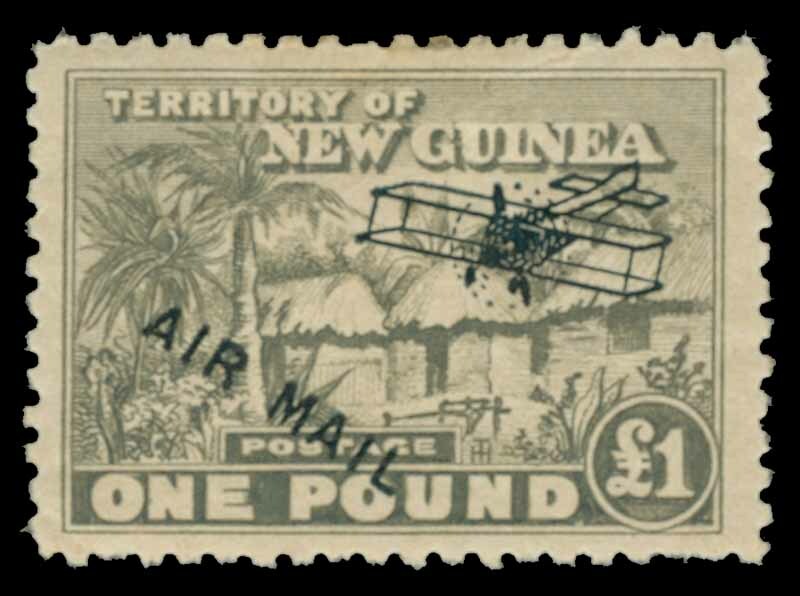 1915 2½d G.R.I. 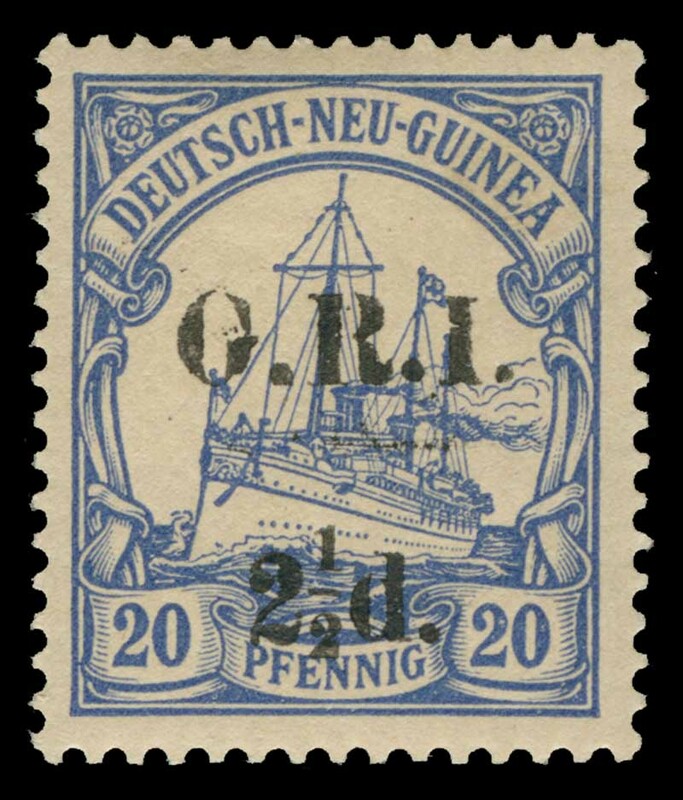 on 20pf Ultramarine German New Guinea Yacht with G.R.I. and value 6mm apart MLH. Setting 4, position 3. Sg 6. Retail $125.00. 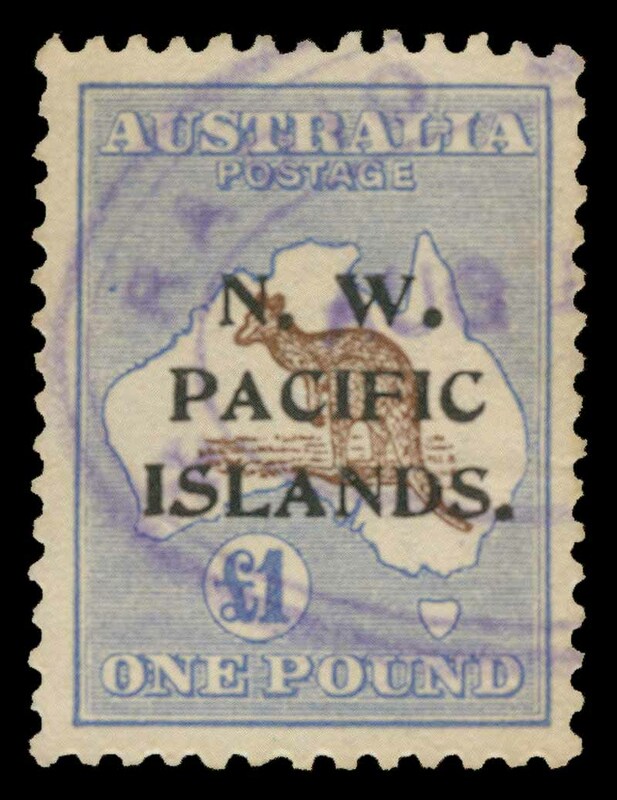 1915 1d G.R.I. on 5pf Green (setting 2, position 3), 2d G.R.I. 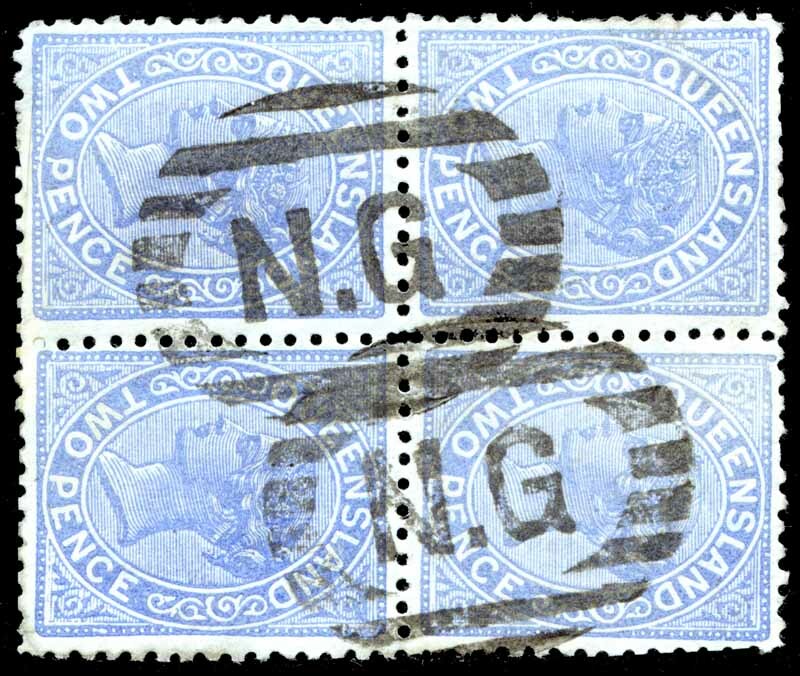 on 10pf Carmine (setting 2, position 6) and 2d G.R.I. 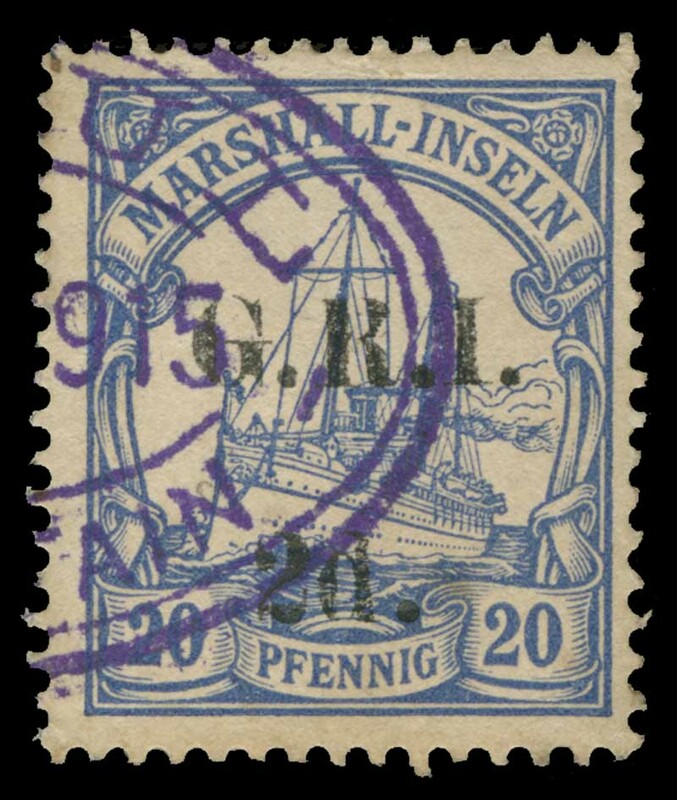 on 20pf Ultramarine (setting 2, position 9) Marshall Islands Yachts with G.R.I. and value 5mm apart MUH, the 2d Ultramarine MLH. 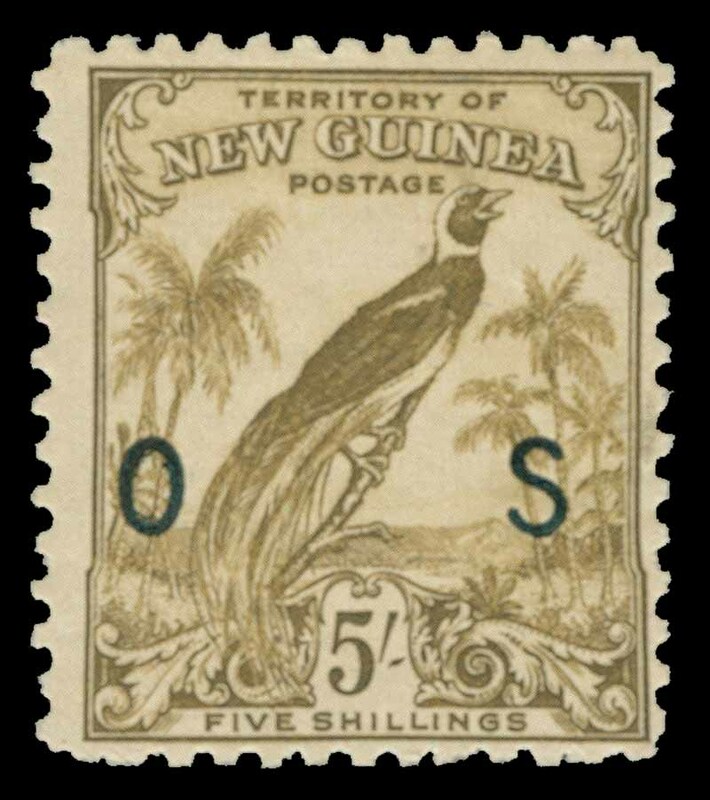 C. Sg 51-53. Retail $255.00. 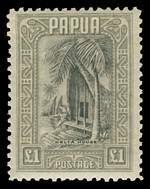 1915 1d G.R.I. on 5pf Green Marshall Islands Yacht with G.R.I. 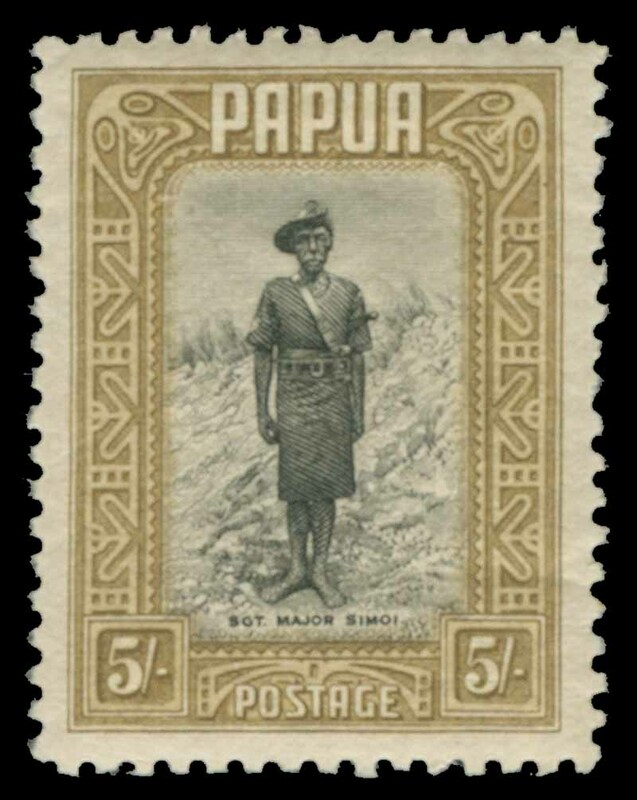 and value 5mm apart CTO with part Violet Rabaul Oval cancellation (Setting 2, position 4) and 1915 2d G.R.I. 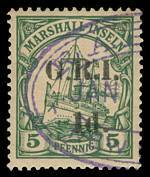 on 20pf Ultramarine Marshall Islands Yacht with G.R.I. 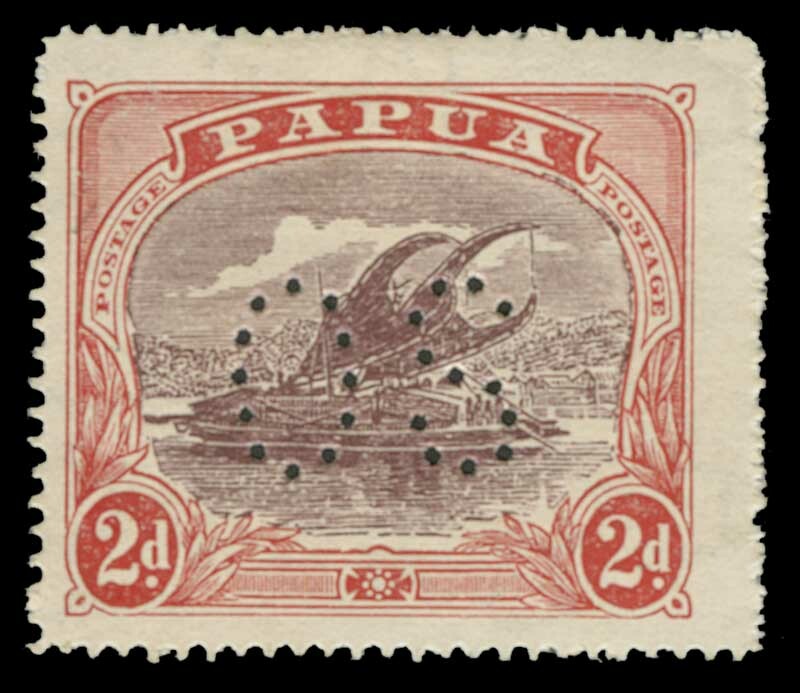 and value 5mm apart FU with part Violet Rabaul Oval cancellation and tiny stain on reverse. (Setting 2, position 6). Sg 51 and 53. Retail $150.00. 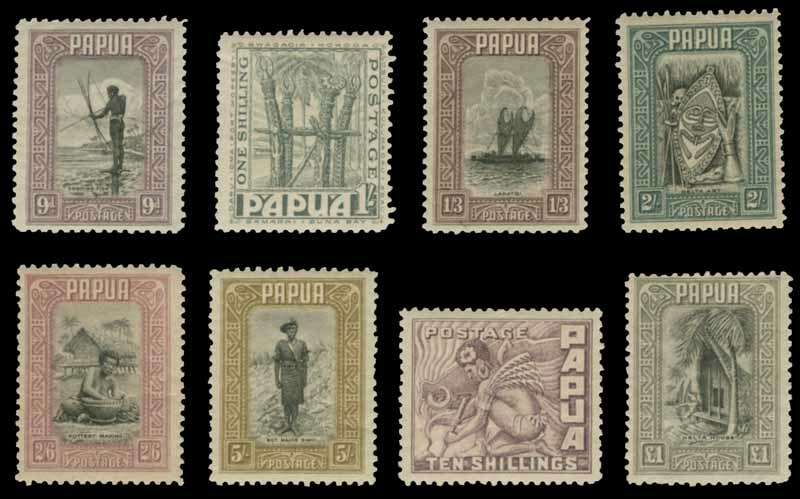 1925 Huts set to 9d value MLH, 1939 Bulolo Airmail set to 6d value FU, North West Pacific Islands 1921 2d Orange KGV perf OS FU and 1923 2d Rose Scarlet KGV perf OS FU. Odd blemish, but mainly fine attractive copies. Sg 125-129, 130b, 131, 212-220, O18 and O19. Catalogue Value £233.00. 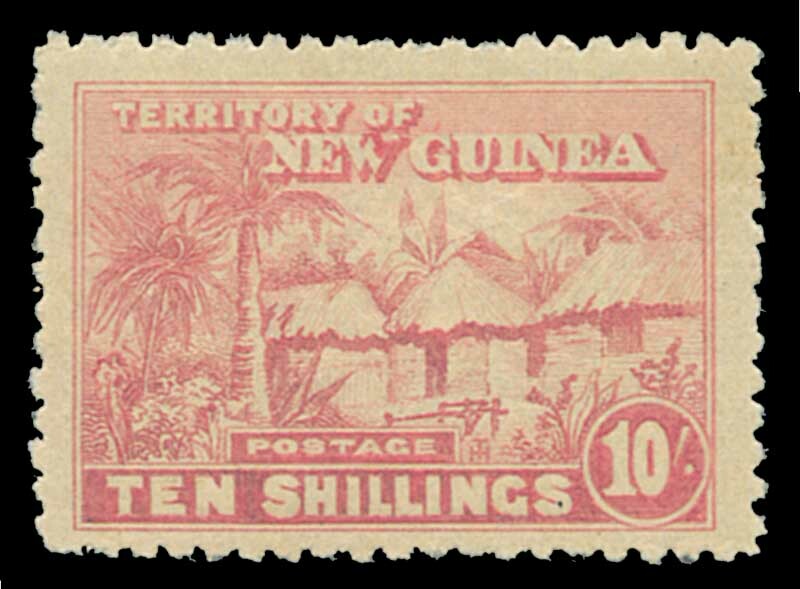 1925 Huts set to 10/- value MLH, excluding 2/- value. 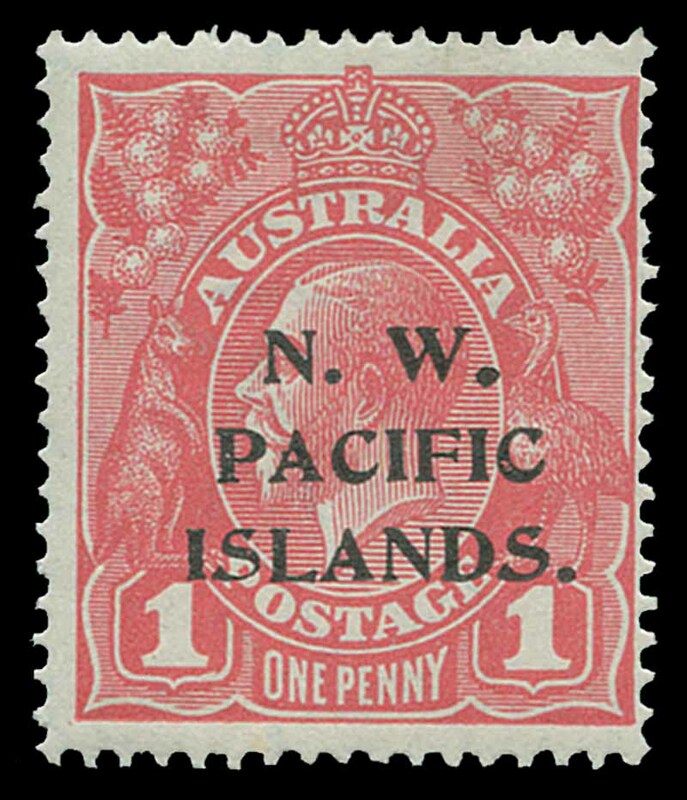 10/- value with inking flaw on "W" of "NEW". Odd minor blemish and short perf. Several lower values MUH. Sg 125-132 and 134-135. Catalogue Value £252.00. 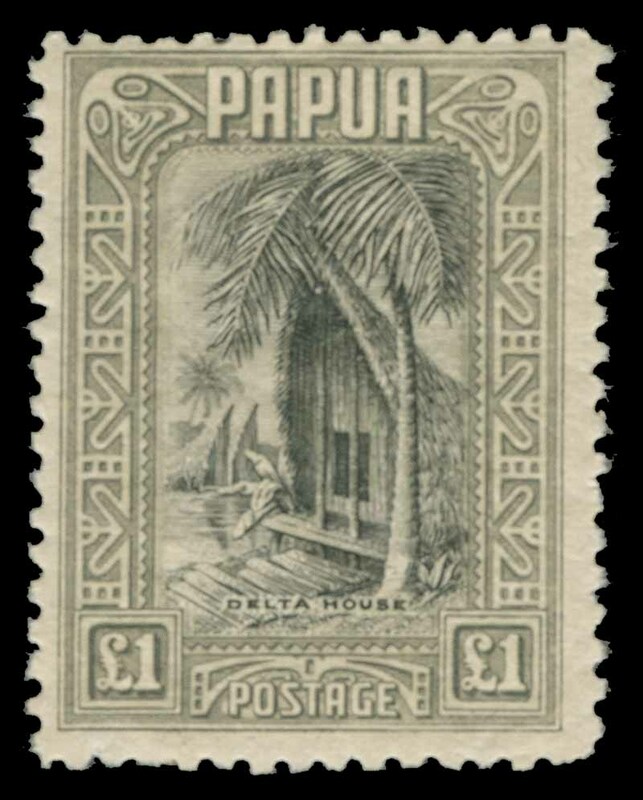 1931 Huts set O/P Airmail excluding 2/- value MLH. 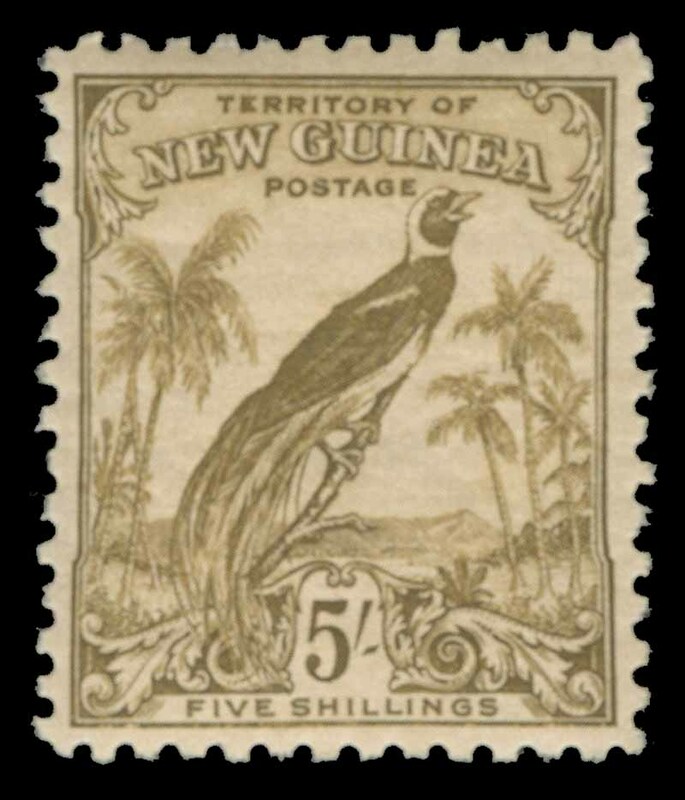 An attractive set with a few minor blemishes, the 5/- value being MUH. Sg 137-145 and 147-149. Catalogue Value £243.00. 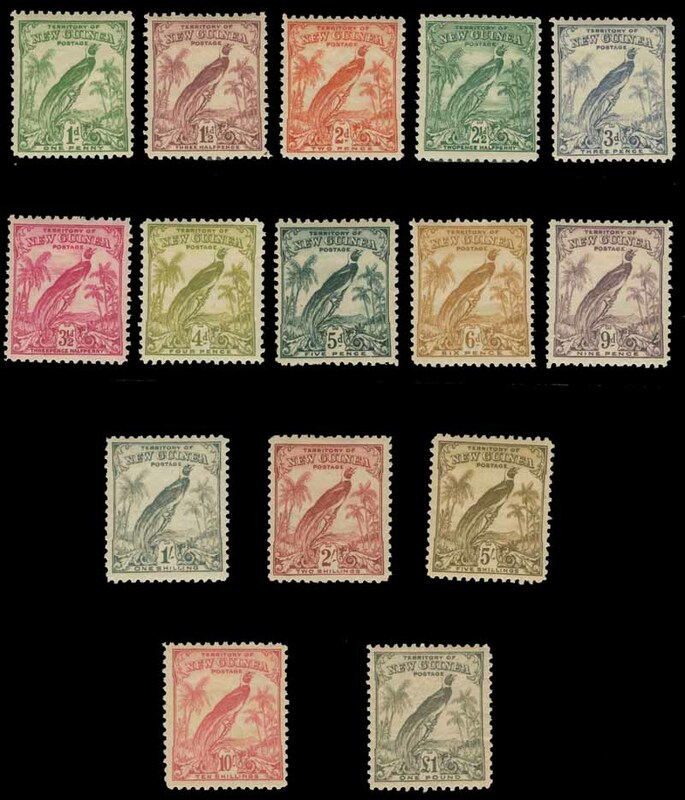 1932-1934 Undated Birds set MLH. 5/- has gum crease. 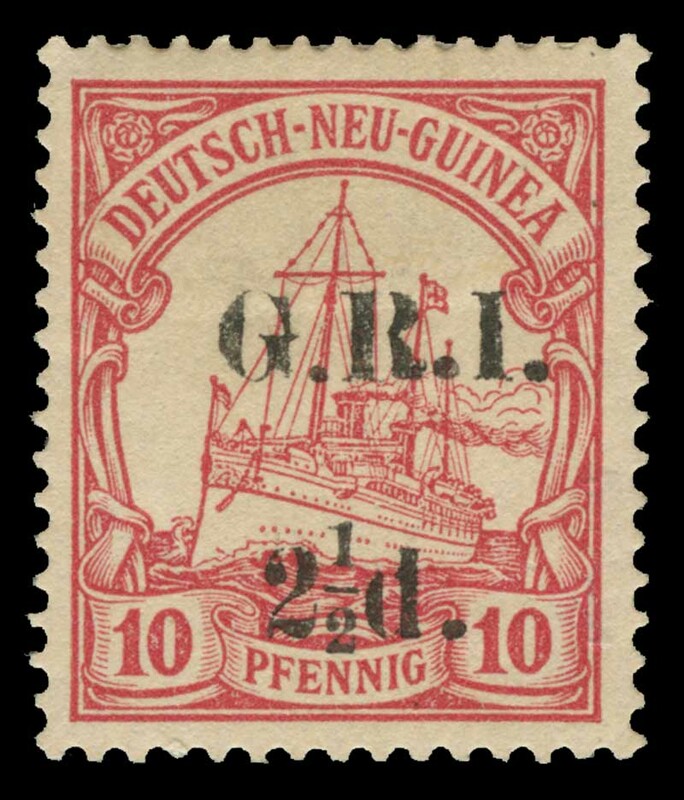 Sg 177-189. Retail $375.00. 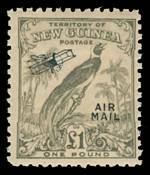 1932-34 Undated Birds of Paradise set O/P Airmail in fine MUH condition. Sg 190-203. 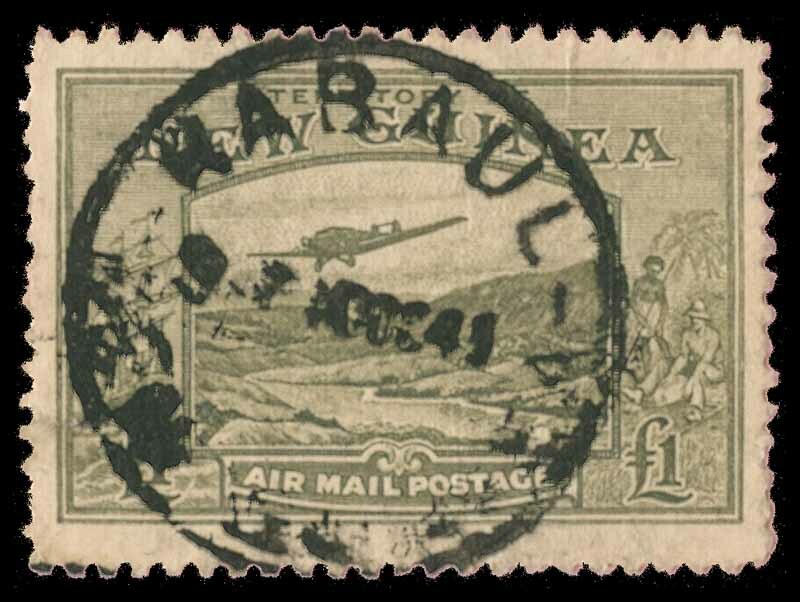 1939 £1 Olive-Grey Air MUH, with a few small gum inclusions. Sg 225. 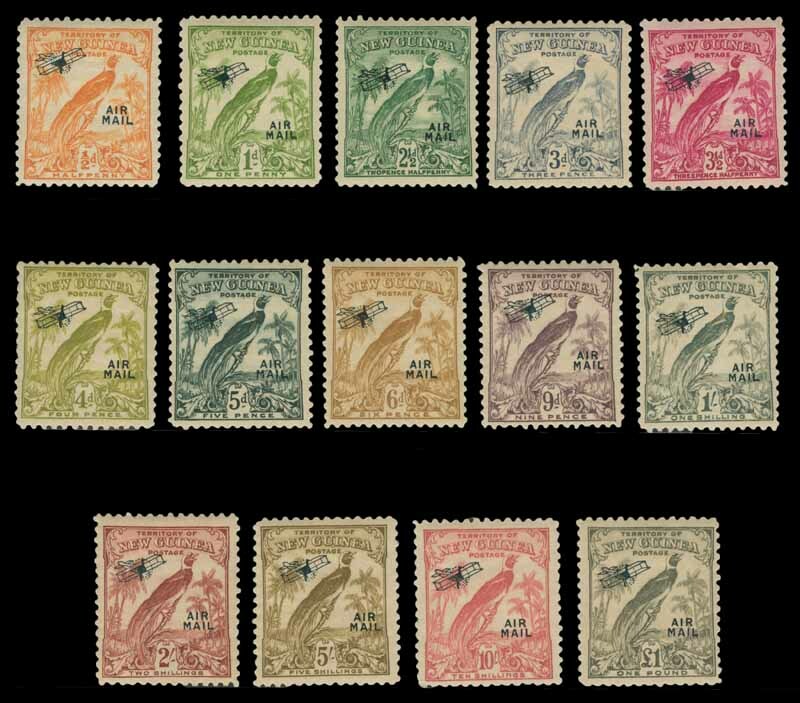 1932-34 Undated Birds O/P OS set MLH. 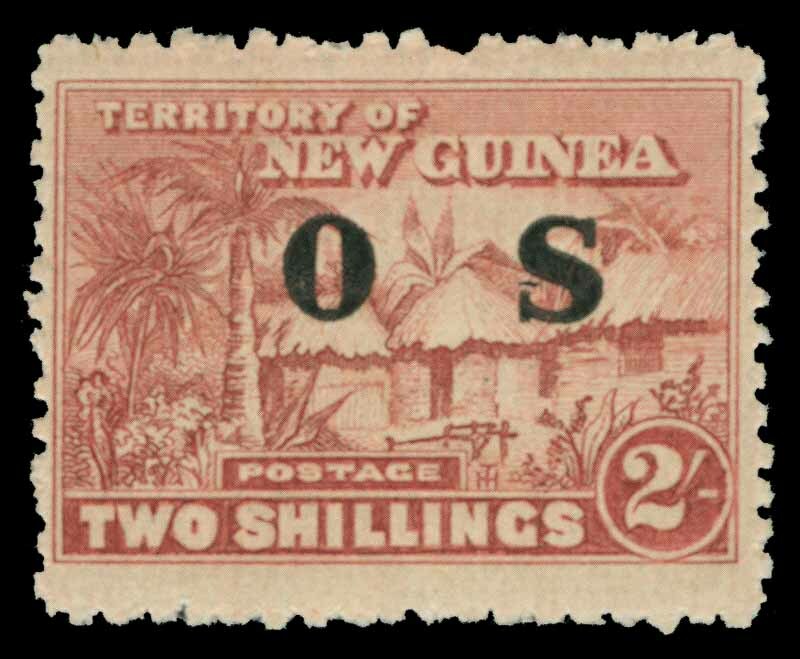 Light gum toning on 2½d and 4d values have light gum toning. 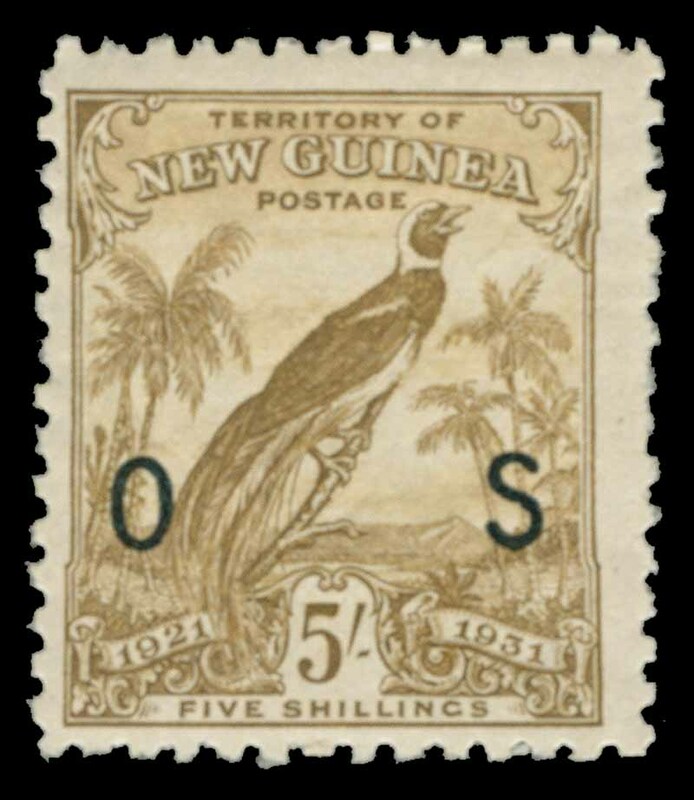 Sg O42-O54. Retail $325.00. 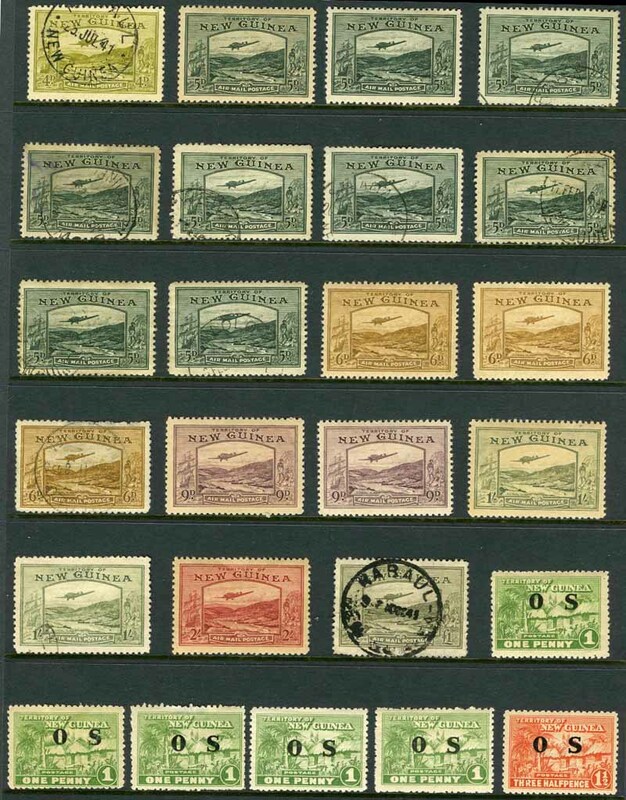 Selection of 155 MLH and 72 used stamps including 1925-1927 Huts set to 2/- MLH, 1931 Dated Birds set O/P Air Mail to 2/- value MLH, 1932-1934 Undated Birds set to 10/- value MLH, 1932-1934 £1 Olive-Grey undated Bird O/P Air Mail FU, 1939 Air set to 2/- value MLH, 1939 £1 Olive-Green Air used with small repaired tear, 1925-1931 Huts set O/P OS MLH, 1931 Dated Birds set O/P OS MLH and more with some light duplication. Catalogue Value £2,198.00. 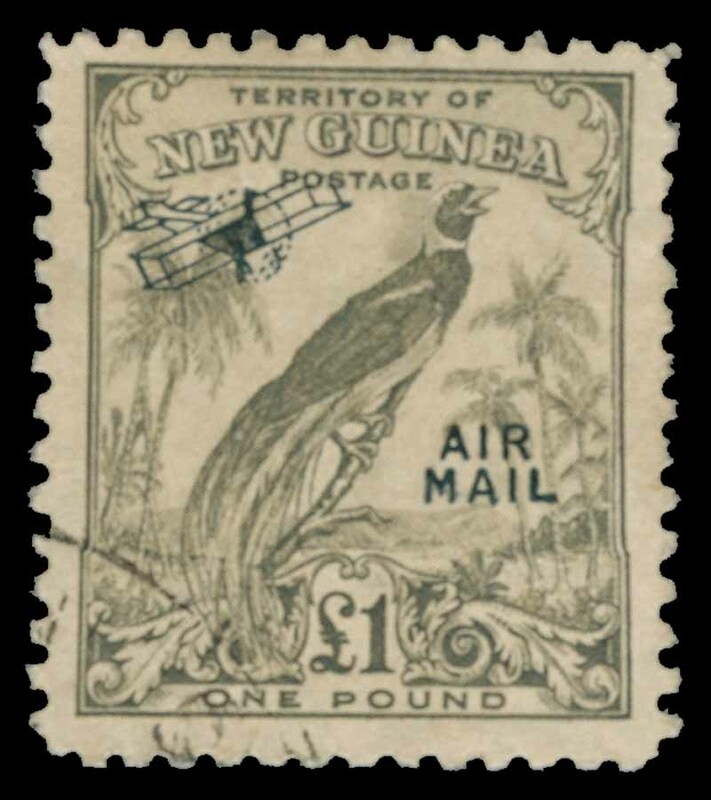 Selection of 134 FDC's from 1952 to 1986 including handy range of early issues and several postal stationary items. 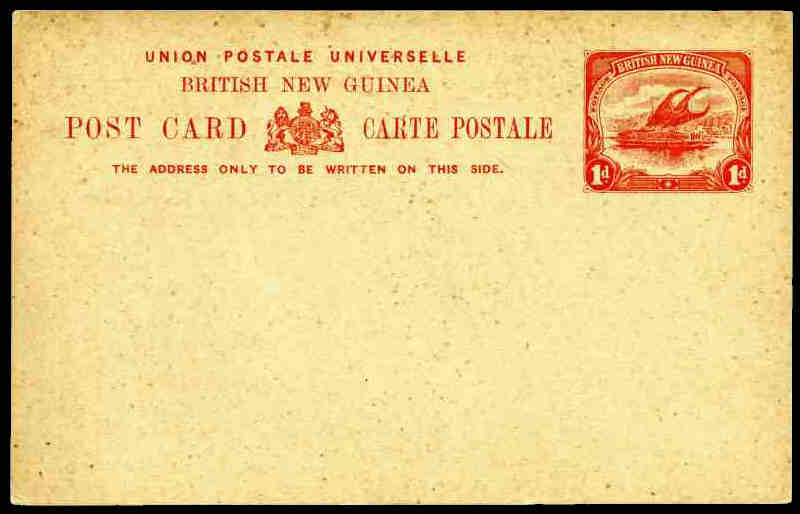 Noted 1959 1/7 Red Registered Envelope addressed to New South Wales, uprated 3d and cancelled on the First Day of Issue. 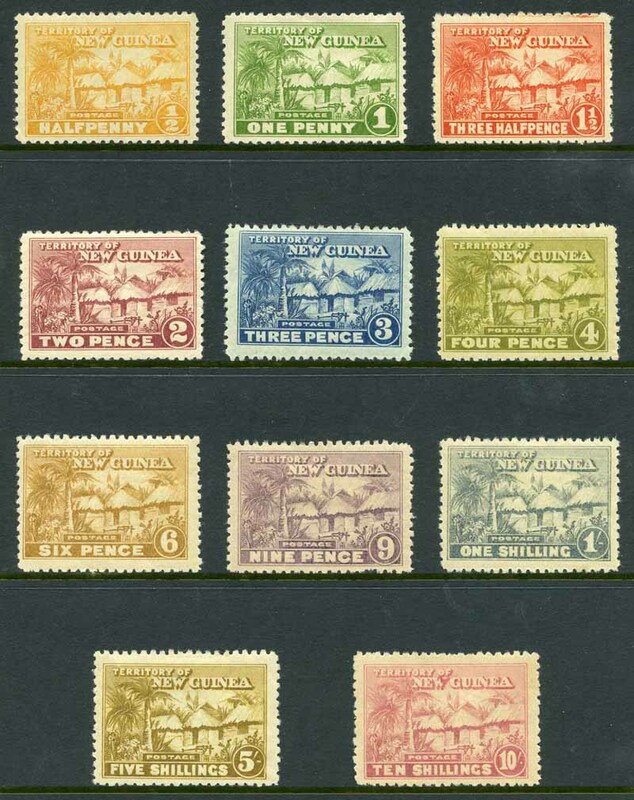 Few early covers with toning blemishes. Complete MLH collection from 1952-58 Definitive set to 1989 Christmas set in Seven Seas Hingeless album. Excludes Postal Charges sets and all issues from 1976 Huts set onwards MUH. Complete MUH collection from 1952-58 Definitive set to 1988 Olympic Games set in Seven Seas Hingeless Album. 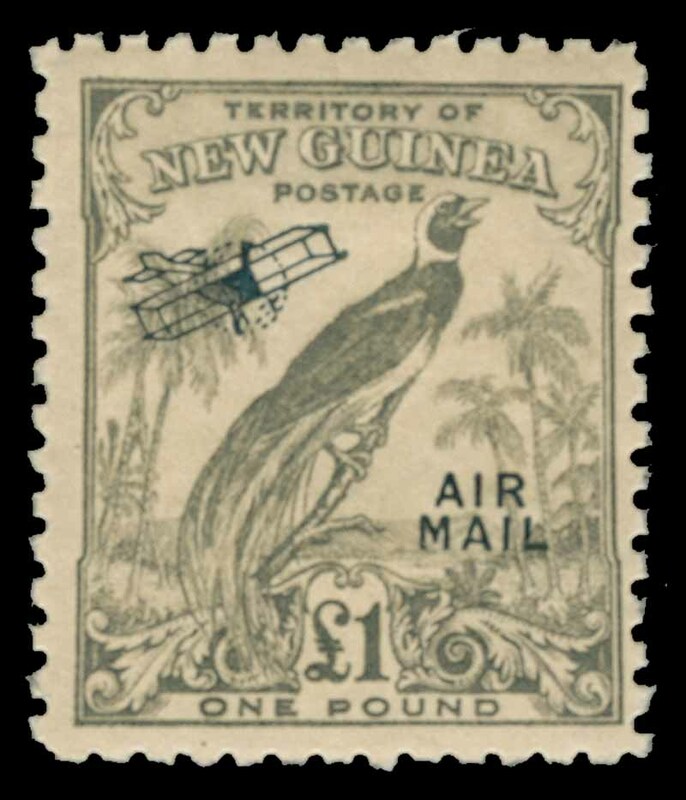 Largely complete MUH and MLH collection from 1952-58 Definitive set to 1987 Aircraft set, mainly on Seven Seas Hingeless album pages. Majority of early issues MLH. Largely complete collection of mint and used stamps from 1952-58 Definitive set to 1996 Flowers set on album pages. 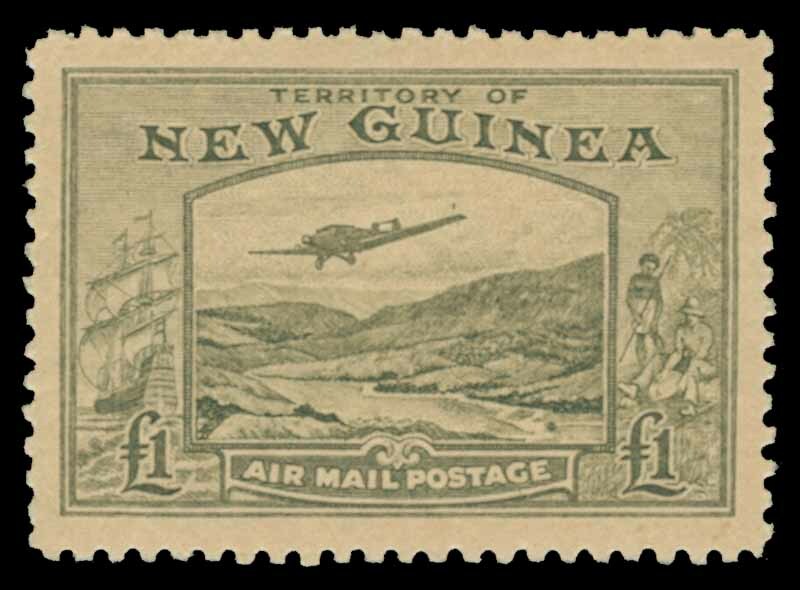 All Decimal issues mint. 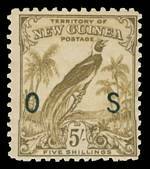 Largely complete mint collection from 1952-58 Definitive set to 1980 Mammals set in Seven Seas Hingeless album. 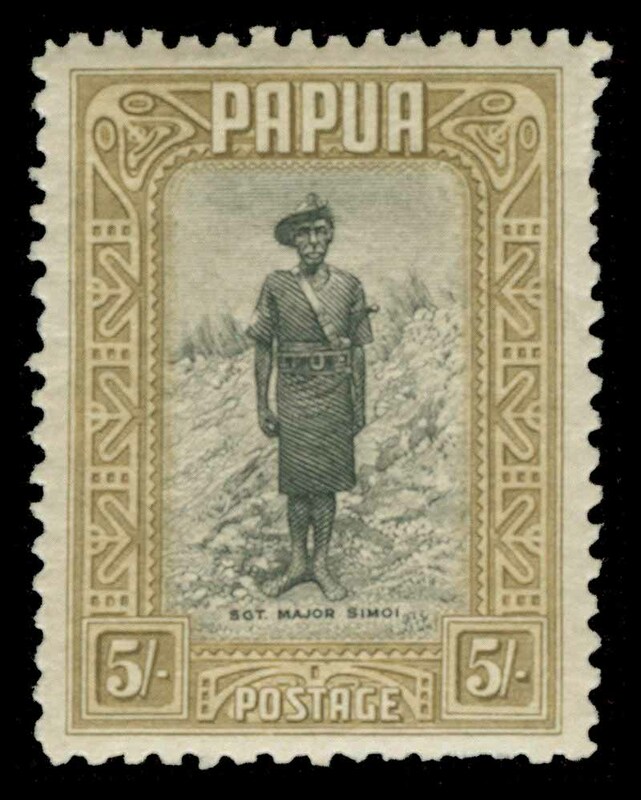 All MUH from 1963 10/- Rabaul onwards, plus small range of duplicate Pre-Decimal issues. 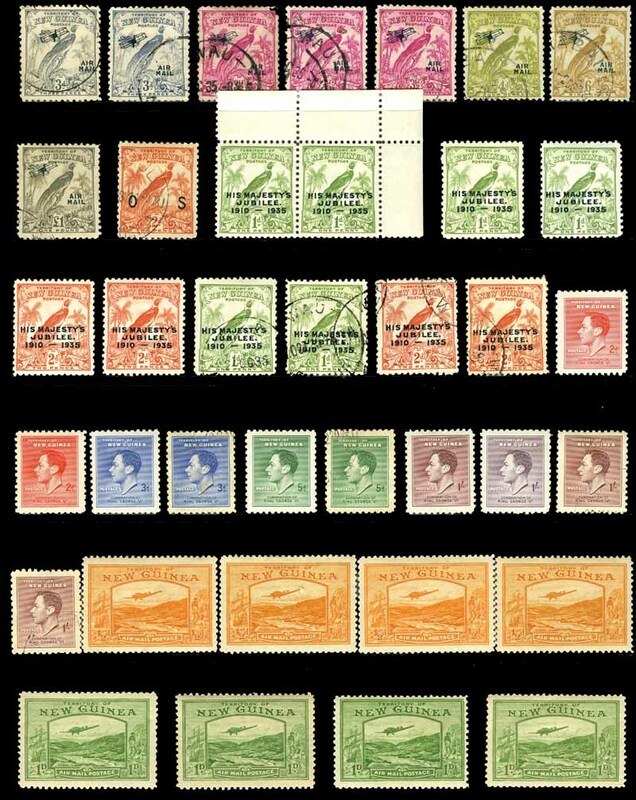 Also collection of MUH Decimal issues from 1966 to 1986 in singles, pairs and blocks in Hagner album. Face Value K455.00. 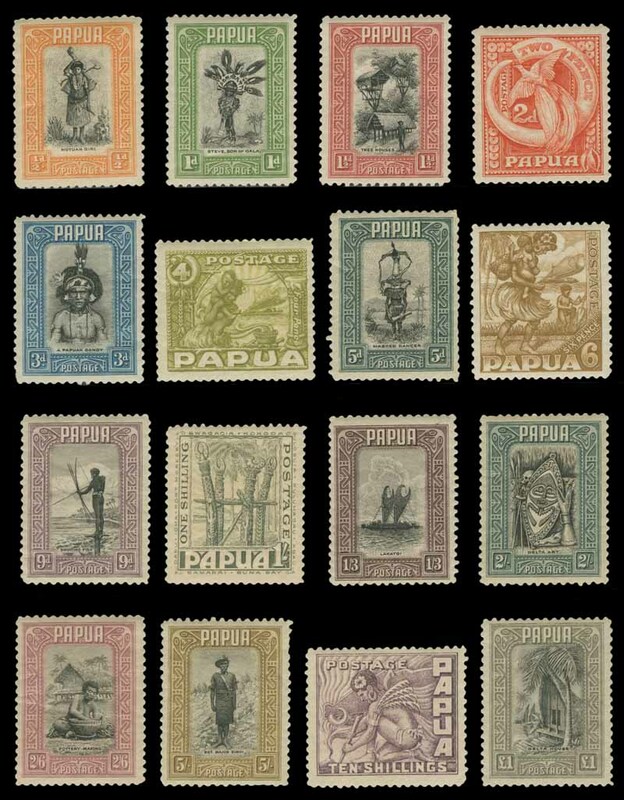 Largely complete FU collection from 1952-58 Definitive set to 1984 Ceremonial Shields set, plus useful range of New Guinea and Papuan issues on Hagner sheets. Some early issues with toning blemishes. 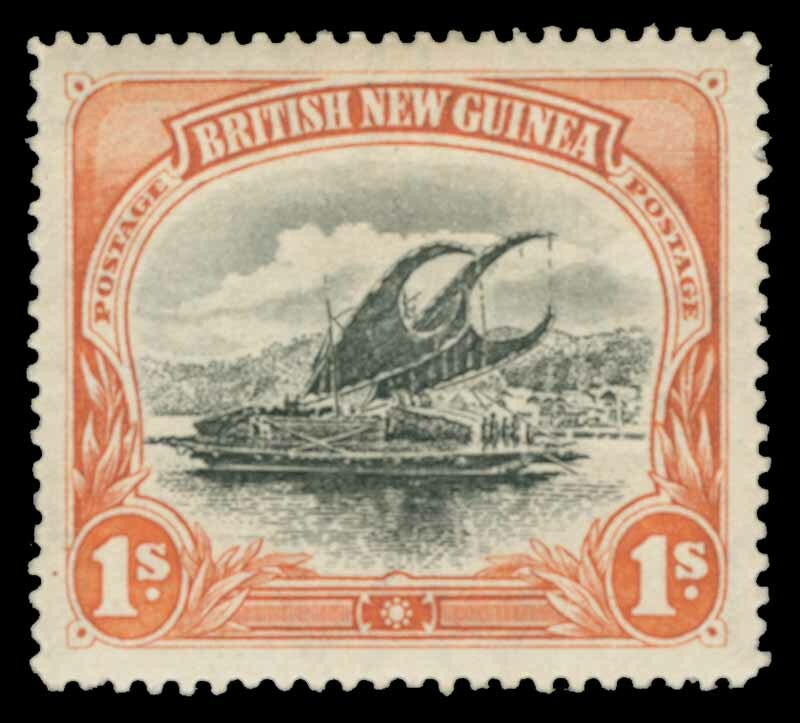 Accumulation of MUH Decimal issues, including largely complete collection from 1966 Butterflies set to 1987 Constabulary set in Seven Seas Hingeless album. 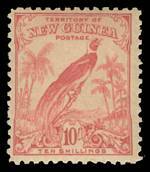 Also range of mint and used Pre-Decimal and used Decimal stamps. 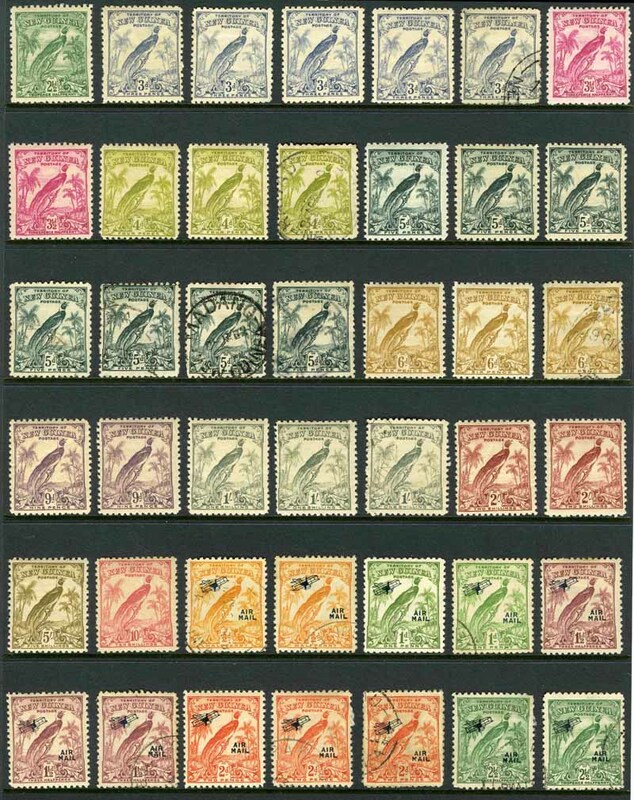 Largely complete MUH and MLH collection from 1966 Butterfly set to 2000 Queen Mothers Birthday set on Lindner and Seven Seas Hingeless pages. 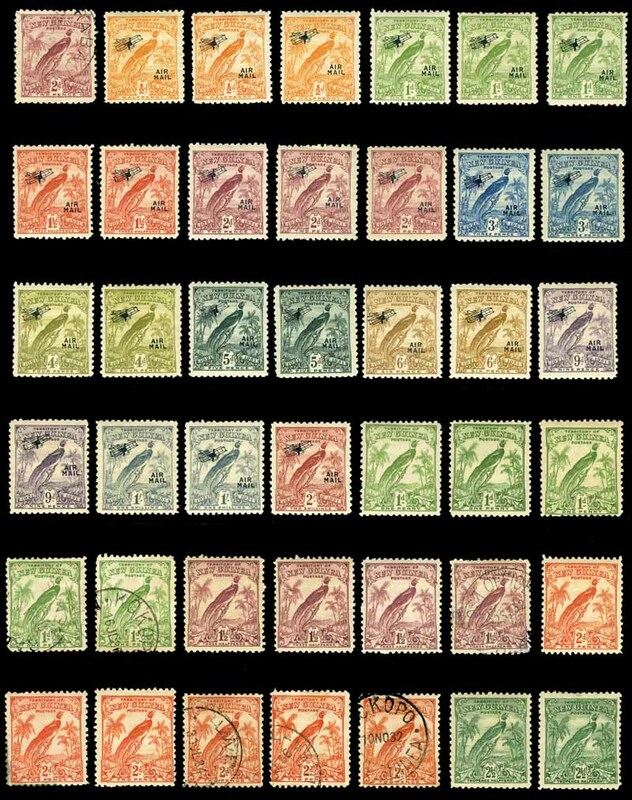 1966 Butterfly set to 1971 Fauna set MLH. Face value of MUH issues K315.00. Complete set of Post Office Year albums from 1986 to 1994 excluding 1988, plus 1995 Year pack (2). Face Value K179.69. 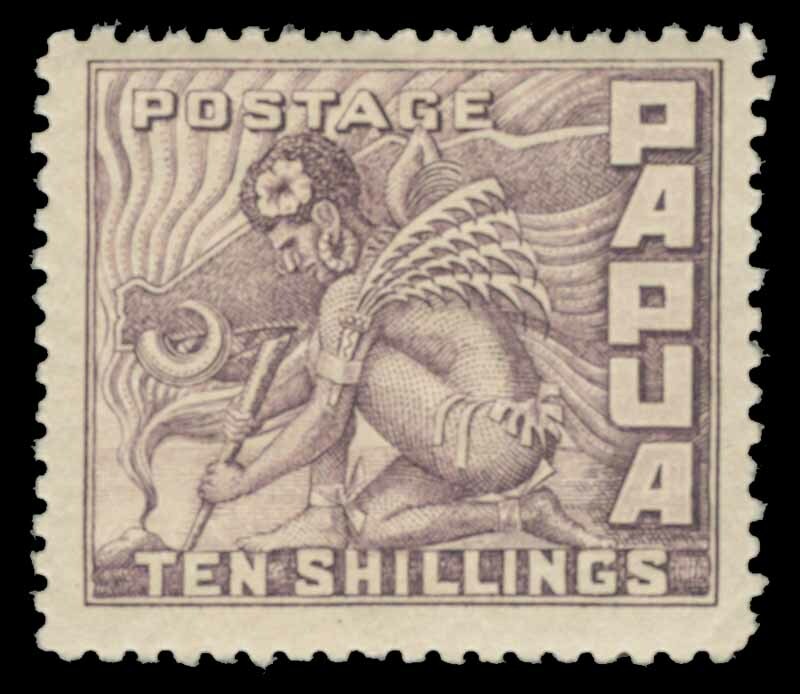 Also 100 FDC's from 1969 to 1999 (Face Value K190.00) and 41 souvenir covers from 1970 to 1978 cancelled with special postmarks. Odd fault. 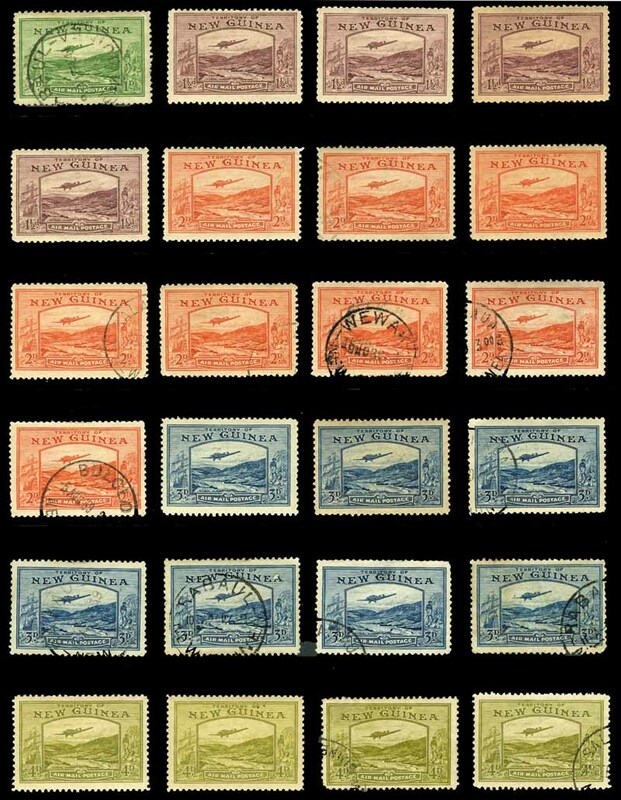 Collection of 38 mostly fine used Pre-Decimal stamps and 357 mostly MLH Decimal stamps on album pages, plus a small selection of mint Great Britain from a range of periods. 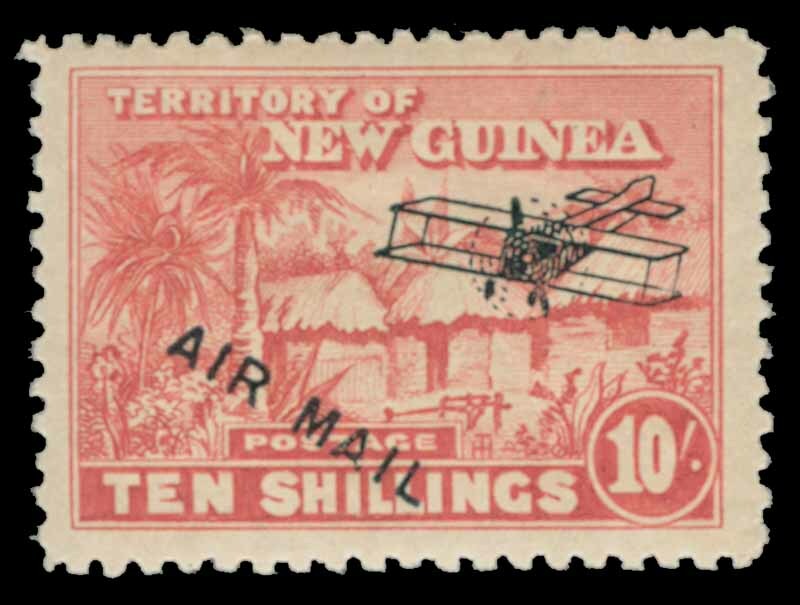 Accumulation of tens of thousands of used Decimal stamps on and off paper, including some MUH sets and Pre-Decimal content. Variable duplication. 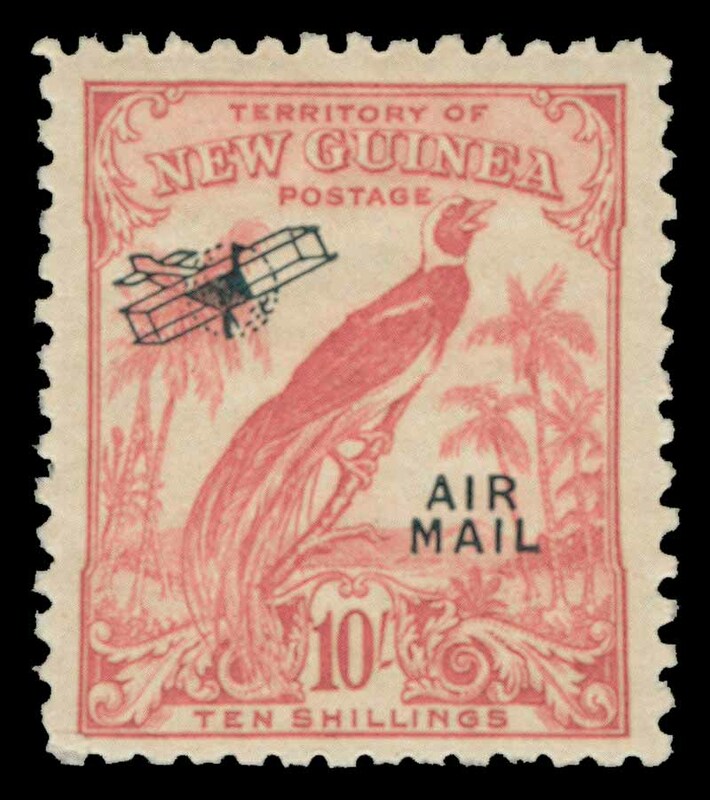 Accumulation of 3,650 used stamps off paper in shoebox. 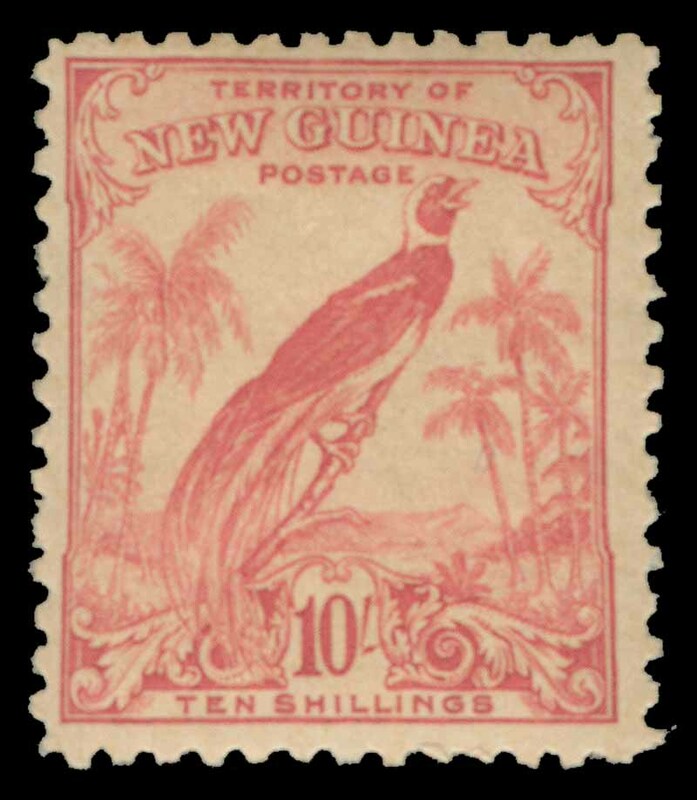 Predominately Decimal issues with some Pre-Decimal content.